The Magical Christmas Wreath Company: Paddles Up! 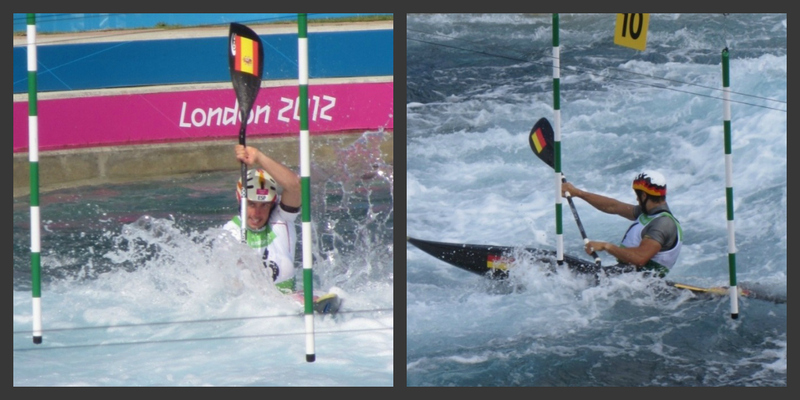 Being a water baby, there were two events that I wanted to see live at the London Olympics - Canoe Slalom and Swimming. 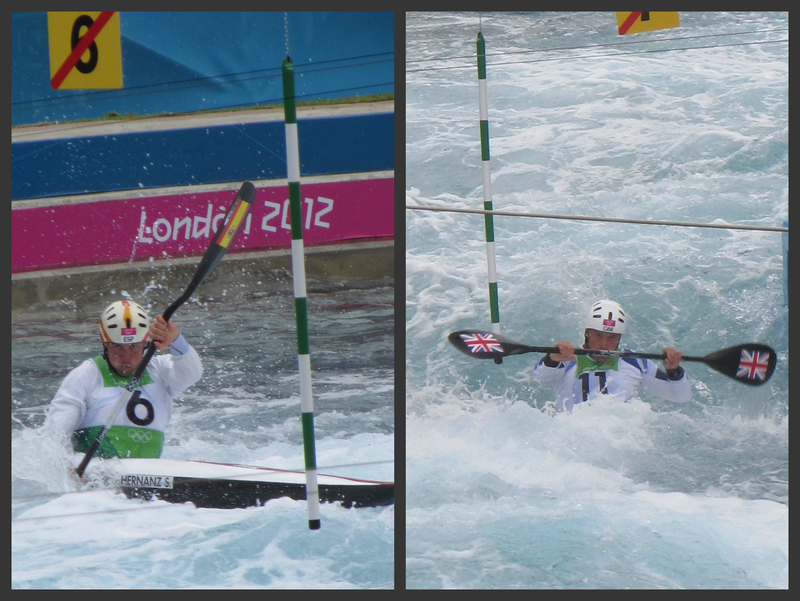 Yesterday was our day to sprint North to the new Lee Valley White Water Centre to watch the Mens Kayak K1 event. After an absolutely thrilling competition the charasmatic, motorcycle-mad, Itailan birthday boy Daniele 'Cali' Molmenti took Gold in his Ducati Red Kayak before blowing kisses to the swooning girls in our row. 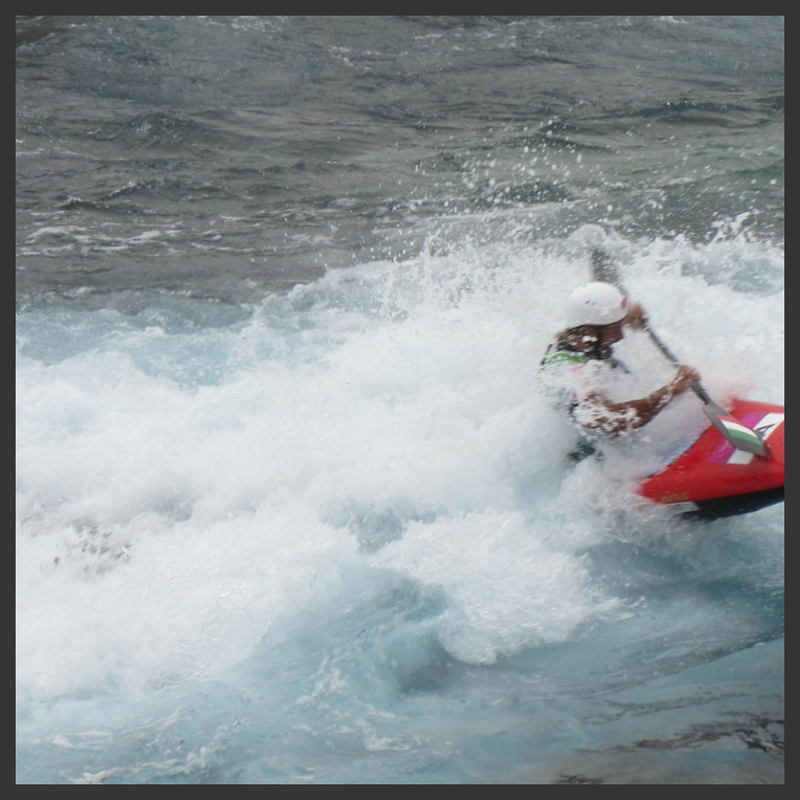 I love the kayaking too, well I love almost every event during the Olympics, especially the ones that involve water. So glad you were able to see this, what fun! I enjoyed going along with you. We are soaking up all the Olympics goodness! Yesterday was a good one for GB so I know you are proud. I am so much in awe of these athletes. So proud of the swimmers that the USA produces, love all the swimming events especially. Keep us posted on anything else Olympics, you lucky man, to have it all in your backyard! You must all be so proud of your incredible swim team Cindy. Swimming is a huge passion of mine and those young dedicated athletes have all my support. I am a water baby too! I love watching the Swimming competition on TV here. 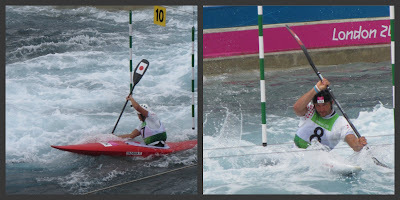 Too bad there is not much coverage of the kayaking and equestrian events here in Canada and the USA. kayaking is an interesting sport! The TV coverage here is all about swimming, gymnastics and rowing. Rowing is big here in Canada. Thanks for sharing. 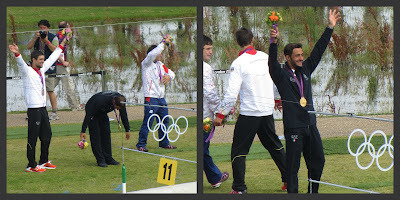 Please keep us posted for more Olympic events there in London. I adore the water too Pamela. If we miss anything we are catching up with the live feeds online. The competion is thrilling. We are enjoying it so much! It is quite wonderful to have something so positive and uplifting to focus on isn't it Phyllis. Alas, we cannot claim to share your enthusiasm for this or, indeed, any sport, but your obvious delight in your 'sprint North' is so very infectious, and your images are wonderful, that we cannot help but enjoy your obvious pleasure. Clearly you has a marvellous day out and for once, it would appear, the rain held off or did not matter. I cheered along on your behalf Jane and Lance. As for weather of which of course I am a huge fan, wild or fair I love it all. I love watching the Olympics too. Anything with water, being a former swimmer myself. I also love the gymnastics. So glad you were able to see some of it in person. Swimming and gymnastics what a great combination Holly . Sadly, I did miss the synchronised swimming. I love all those Esther Williams numbers! you're lucky to have had the chance to see that! Beautiful pictures - and beautiful colours. The freshness of the water (ahh! could use a splash of that here in the hot air), the movements captured - great! How wonderful to have the Olympics at your back door and to be able to see you favorite events live. I love everything about the olympica and have watched almost nonstop. 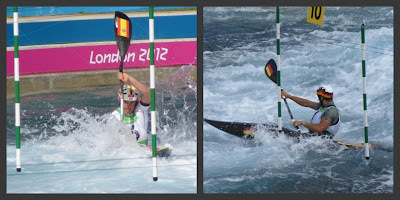 We watched the canoe finals, very cool! I get so excited for them, and can't help but cheer them on and wish them well. I also got totally swept up in the moment Leslie. Thanks for sharing this Paul. We have a Nova Scotian in a Kayak event coming up..sure hope he and his team mate place. It is an honor to be an Olympian, winning a medal or not. Great photos!! My exact sentiment Bren, we cheered for everyone at the events, I must say it was a rousing experience to be a spectator at the games. How awesome you could be there!! 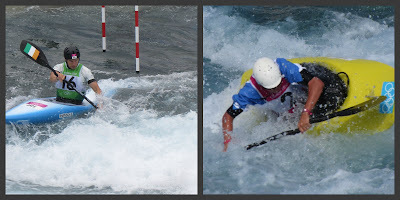 !I love water sports too. We are Olympic watchers here. Keep watching Ann, keep cheering. That is quite an event....water forces at work with muscle...there's my title. hahahhaaa. Great to have Olympics at work. Pretty exhausting stuff I say Mary. Love the new avatar. The racing at the white water centre in Lee Valley looks such an exciting thing to watch - lucky you Paul. How about a gold and silver this afternoon for the C2s we nearly raised the roof off our house. How lucky you are to have watched it in person! I just watched it on TV - fantastic sporting event. Quite exhilarating wasn't it JoAnn. I watch the Olympics everyday and it's a lot of fun though I am in front of the tv. I can not imagine myself if I am there watching the players do there very best. Thanks for sharing the photos and joiningWater World Wednesday I do appreciate it. that's some ruff and tumble water stuff man! I hope everyone you want to get medals is getting them! Really exhilarating stuff isn't it! I'd love everyone to get medals, watching such wonderful determination and enthusiasm is so inspiring. I just watched this today. Your present is our future:) That was a great competition. Every jumped in for a swim afterwards...what fun! Glad you were able to make it. Are the tickets outrageously priced? Silver and Gold...congrats! Tickets come in a range of prices with availability now somewhat difficult but not impossible. Its a case of being prepared in advance or being quick to grab the last few tickets that are gradually being released. I knew you would have good Olympic posts! So jealous you are there being able to watch the events! I'm glad you were able to attend these events. Your photos are wonderful. Oh, wonderful indeed to able to see some of the Olympics! I do love the water events and your photos are terrific! Enjoy your weekend!! How wonderful that you managed to get tickets to your favourite events! The pictures are great, beautifully captured action. Reflections are hard to catch on moving water... But the pics are awesome ! Exhilarating shots ... wonderful, indeed! Cheers ... visiting from Weekend Reflections! Great pics, you really captured the action Paul. One of my favourite events too. Hi there - great set of pictures - interesting to see how the Australian swimmers are being treated here given that they did not do as well as they thought they were going to! Ohh I must knew you'd be there-- at the Olympics. SO exciting for you!! I've been watching every evening-- enjoying every event! It's been amazing!! Love seeing your personal photos-- I'm a tad bit jealous!!! Keep posting photos!! Cool shots. I envy that you because you can easily watch the Olympics. Beautiful shot. Happy sky watching. 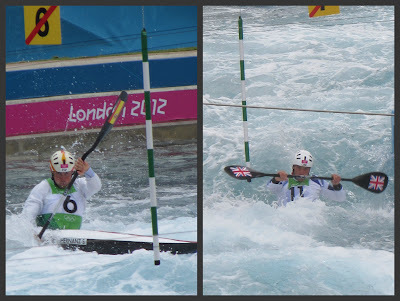 Great action pictures Paul, very lucky to have got tickets to the Olympics.. Awesome photos! Thanks so much for sharing this inspirational post on Simple & Sweet Fridays! Lucky boy to see this Olympic Event live. Daniele is gorgeous.